Day 1 A bit of luck ensured that I had gotten sick before the big hiking trips kicked in. 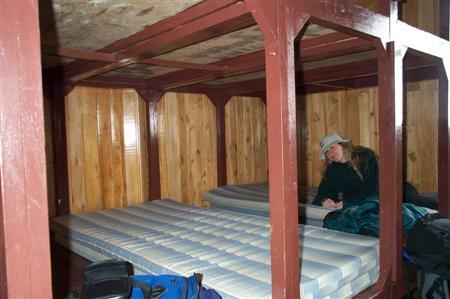 It seemed pretty standard for foreigners to experience gastrointestinal distress within a few weeks of arriving in Quito. For me this meant yelling at the cab driver to pull over and barely getting out of the cab before projectile vomiting. That was quickly cured with a brief round of meds, and then I was good to go. David wasn't so lucky. 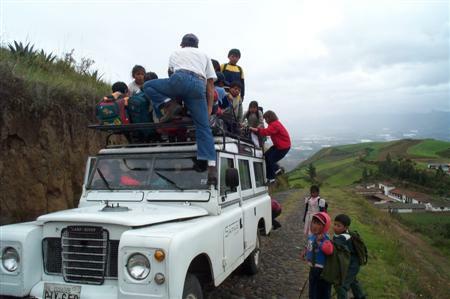 OK, he was lucky not to projectile vomit, but he endured his own abdominal trauma at the wrong time -- right after returning from Guagua Pichincha. This set him back physically and prevented him from coming on the two really big climbs. 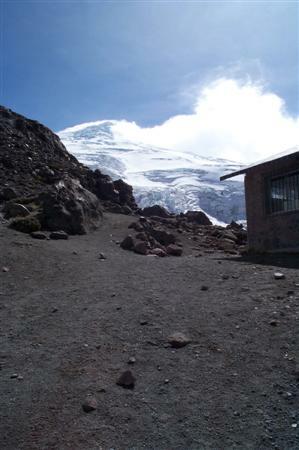 The first big climb was to be Cayambe, Ecuador's third-highest volcano. The summit is at 19,000 feet (5,790 meters). 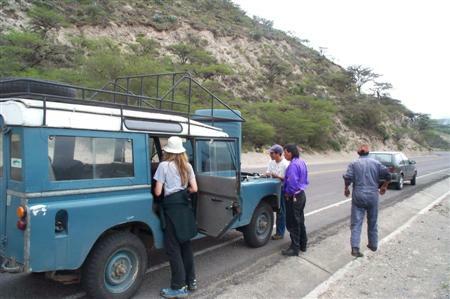 Soon I found myself in a broken down Land Rover on the road to Cayambe. You can see from this picture that the terrain en route was basically desert. 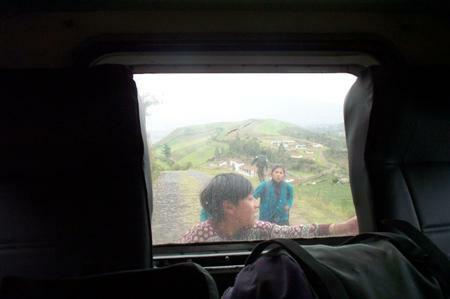 This next bit was one of my favorite moments on the Ecuador trip. 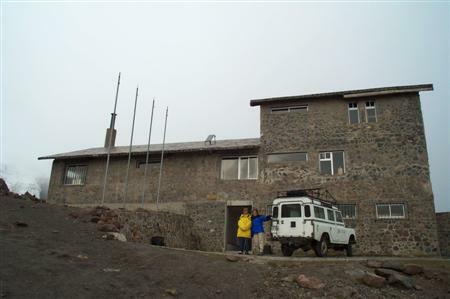 Our guide Pepe had phoned in a new Land Rover and driven us to the base of Cayambe. We then turn onto the dirt road leading up to the refuge. It was a sparsely populated agricultural area with a few little houses and the occasional church. Then we rounded a bend and passed a school with kids coming out the front entrance. They started to chase the Land Rover! 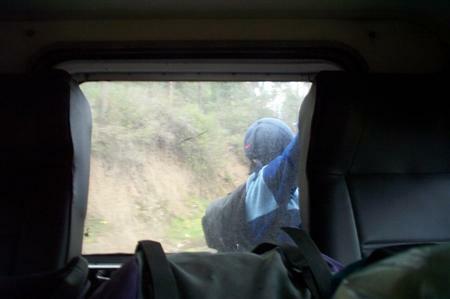 They ran behind us and caught up because the bumpy road made us go slowly, and then they tried to hang on to the back of the vehicle! ...and he helped a few more climb on top! 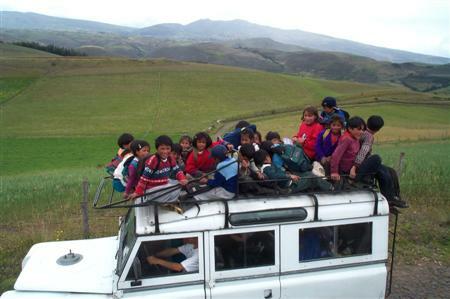 We got a full load of kids on board--the whole gang! 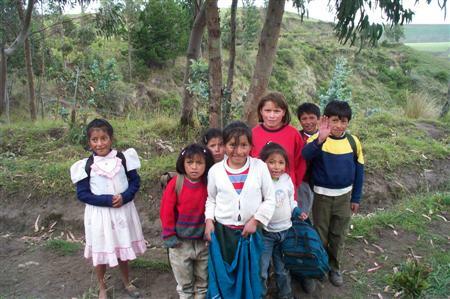 Another cool moment was hearing Pepe refer to the kids as guaguas, using the Quechua term for "children". 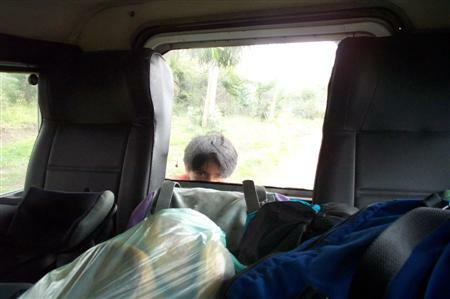 I noticed him using several other Quechua expressions mingled in with his Spanish conversations with other Ecuadorians. Their parents were very happy to see them, but a little surprised at their chosen conveyance. I felt like we were the school bus, pulling up, dropping off kids, and waving to the parents at each stop. Not ten minutes after dropping off the last of the kids we came upon a group of four backpackers walking up the road. It was a pretty steep road, so our guide offered to give them a ride. That was cool with Cari and me. We offered to let them sit inside with us, but they declined. So they climbed onto the roof! The road got steeper and steeper, and bumpier and bumpier. It was unbelievably rough going. At each rutted turn overlooking a precipitous drop, we were sure that our hitchhikers were going to fall right off the edge. But somehow they held on. At the refuge we got to know them a little bit. 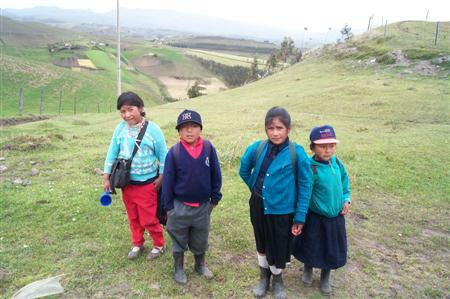 They were a group of four Colombians. The one man, about forty years old, seemed to be a full-time gypsy. One woman seemed to be his girlfriend, and she told us she and the other woman were from Medellin where she worked as a physical therapist. The three of them had taken off to show her sixteen-year-old daughter a bit of the continent. The four of them had tons of charm, with a fabulous accent to their Spanish -- a little rasp, a sly kind of slur to the pronunciation of the "s". And the woman from Medellin and her daughter were very beautiful.